Azuela Cove, Davao City – German Markus Rolli and defending women’s champion Czech Radka Kahlefeldt took the lead from the start then survived every challenge to post wire-to-wire victories in the men’s and women’s categories of the Alveo IRONMAN 70.3 Davao Presented by Petron held here Sunday. Markus Rolli savors the sweet taste of a breakthrough win here. Rolli, who is in the Philippines for the first time, was the first out of the water and led by a few seconds over Eric Watson, Sam Betten, 2018 champion Mauricio Mendez, Tim Reed, Antony Costes, Tim van Berkel and Craig Alexander. The 27-year-old Rolli blew out the field in the bike ride and extended his lead to eight minutes over second placer Alexander at the transition to the run. Rolli then held on to barely survive the challenge of the 46-year-old Alexander winning by a little over two minutes. “I think I overbiked. After the bike I wasn’t actually feeling well but I already had an eight-minute lead. So I just gave my best. Winning feels great. The people here are amazing. They were cheering all along the course. It was a great experience. They just pushed me through pain,” said Rolli. Kahlefeldt, 34, and Caroline Steffen, 40, were neck and neck through the swim, the bike and majority of the run. Kahlefeldt gradually wore down her older opponent late in the run to pull away and win comfortably. 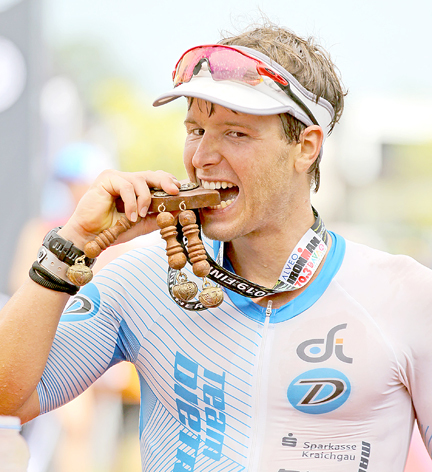 Kahlefeld won the inaugural Alveo IRONMAN 70.3 last year. She said it was more difficult to win this year. “The whole race was hard since I had to fight it out with Caroline (Steffen). It’s never easy to beat her. I’m just very happy that I could come back and win again,” said Kahlefeldt who finished with a time of 4:12:56. Other winners include Steffen with a time of 4:19:28. Kirralee Seidel (4:28:37), Dimity Lee Duke (4:32:41) and Lisa Tyack (4:39:19). Mauricio Mendez, who rallied past Reed in last year’s inaugural Alveo race in Davao had mechanical problems with his bike and didn’t finish the race. After the Alveo IRONMAN 70.3 Davao Sunrise Events will next hold the Sun Life 5150 Cebu on April 28, the Century Ironman 70.3 Subic on June 2, the Penong’s 5150 Davao on July 7, the Regent Aguila IRONMAN 70.3 Philippines on August 11, the Black Arrow Express 5150 Subic on October 27 and the Sun Life Cycle PH in November. Title sponsor of the past race is Alveo, an AyalaLand company. Presentor is Petron while venue hosts are Lungsod ng Dabaw, Azuela Cove and the Enderun Tent, bike course partners Davao del Norte, Panabo, Tagum and Carmen, official courier and logistics partner 2Go Express, official swim cap TYR, official energy gel GU, official nutrition Vitargo, official eyewear Rudy Project, and Aboitiz Power, Davao Light, David’s Salon, Davao Metro Shuttle, Prudential Guarantee, and media partners ONE Sports on Cignal, the Philippine Star, Trilife, AsiaTri.com and Finisher Pix.